American president who was 35th President of the U.S. (1961-63). During his term, he had to deal with the situation of Russian offensive nuclear weapons in Cuba, discovered in Oct 1962. By 1963, a test ban treaty was established to slow the arms race. He was assassinated later that year. Address to Joint Session of Congress, on Urgent National Needs (25 May 1961). Readers of a certain age will remember the awe of viewing the first man stepping out onto the moon, as seen around the world on live TV. If you are reading this, only having seen documentaries about the daring accomplishment, you may not know the events that led up to Man's greatest voyage of exploration, bar none. The true origins of the moon shot begin at a darker time. After you follow the pre-history, your understanding of the full meaning of the moonshot may be extended. You surely know of many of the following events in isolation, but here is a timeline so you can see how they relate with each other, and few years, months, or days between them. —“The Sinews of Peace” speech, Westminster College, Fulton, Missouri. Tension increased as the blockade of Berlin began on 24 Jun 1948, the Soviets tested their first atomic bomb on 29 Aug 1949, and the more powerful hydrogen bomb on 12 Aug 1953. Krushchev gave his “we will bury you” speech in Moscow on 18 Nov 1956 (though meaning burying the corpse of capitalism, not the threat of nuclear war as many in the West misinterpreted it). The biggest shake-up to America's pride in its technology—and its status in the world—was when the Soviet Union on 4 Oct 1957 launched Sputnik, the first man-made satellite to orbit the Earth, transmitting a “beep-beep” chirp received by ground stations in England and America, and re-broadcast on radio and television news. The U.S.S.R. had established diplomatic relations with Cuba on 7 May 1960. By 19 Oct 1960, responding to the nationalisation of American property there, the U.S. ended all exports to Cuba. The Soviet government stepped in with economic support, gave diplomatic recognition to Fidel Castro's government, and their alliance was cemented. The U.S. closed its embassy in Cuba on 3 Jan 1961. Notably, as a possible staging point for Soviet aggression the island of Cuba lies just 90 miles from Florida—the American mainland—easily within the range of the existing technology of inter-continental ballistic missiles. This was the political climate that existed when John F. Kennedy was sworn in as President on 20 Jan 1961. As soon after that as 12 Apr 1961, the Soviet cosmonaut Yuri Gargarin became the first human in space who also completed an orbit of the Earth. With a month, Alan Shepard became the first American in space, on 5 May 1961. 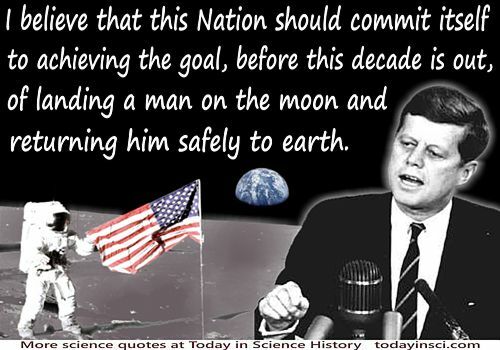 Days later, Kennedy gave his dramatic speech to Congress (25 May 1961) declaring his goal of landing a man on the moon. Kennedy's final topic concerned Space. Imagine how breath-taking it must have been to hear his earnest challenge to Congress that America should not only set a goal of putting a man on the Moon, but to do so within the decade. The Space Race began. If you have not done so before, go out tonight to look at the moon, and say to yourself, “It's 238,900 miles (384,400 km) away, and twelve humans have walked on its surface.” Ponder on that thought—it's jaw-dropping. On the night of 13 Aug 1961, construction began on the Berlin Wall. Kennedy prevailed in the Cuba Missile threat of Oct 1962, and the Soviet nuclear missiles were removed from Cuba on 5 Nov 1962. Little more than a year later, President John F. Kennedy was assassinated on 22 Nov 1963. He envisioned, but would never see a man land on the moon. Nevertheless, the historic moon landing happened on 20 Jul 1969, in about just eight years after Kennedy's challenge to Congress that it should happen “before this decade is out.” Indeed, men walked on the moon, and his goal was met. I believe we possess all the resources and talents necessary. But ... We have never specified long-range goals on an urgent time schedule, or managed our resources and our time so as to insure their fulfillment. Recognizing the head start obtained by the Soviets with their large rocket engines, ... while we cannot guarantee that we shall one day be first, we can guarantee that any failure to make this effort will make us last. No single space project in this period will be more impressive to mankind, or more important for the long-range exploration of space; and none will be so difficult or expensive to accomplish. We propose to accelerate the development of the appropriate lunar space craft. We propose to develop alternate liquid and solid fuel boosters, much larger than any now being developed, until certain which is superior. We propose additional funds for other engine development and for unmanned explorations--explorations which are particularly important for one purpose which this nation will never overlook: the survival of the man who first makes this daring flight. But in a very real sense, it will not be one man going to the moon--if we make this judgment affirmatively, it will be an entire nation. For all of us must work to put him there. Secondly, ... accelerate development of the Rover nuclear rocket. This gives promise of some day providing a means for even more exciting and ambitious exploration of space, perhaps beyond the moon, perhaps to the very end of the solar system itself. Third, ... accelerating the use of space satellites for world-wide communications. Fourth, ... for the Weather Bureau—will help give us at the earliest possible time a satellite system for world-wide weather observation. Let it be clear that I am asking the Congress and the country to accept a firm commitment ... and carry very heavy costs: 531 million dollars in fiscal '62—an estimated seven to nine billion dollars additional over the next five years. ... It is a most important decision that we make as a nation. But all of you have lived through the last four years and have seen the significance of space and the adventures in space, and no one can predict with certainty what the ultimate meaning will be of mastery of space. This decision demands a major national commitment of scientific and technical manpower, materiel and facilities, and the possibility of their diversion from other important activities where they are already thinly spread. Science Quotes by John F. Kennedy.